and you won't be disappointed!! Fall Friends Stamps and Dies!! I love Autumn, it's my favorite time of the year, so when I saw this set I was totally in love!! The critters are adorable, I had to pair this cute little fox up with the trees from the Seasonal Greetings Set. The green hillside was created using one of the dies from the Fun Stitched Edges set. For the sky I used a template made from the Fun Stitched Cloud dies and Tumbled Glass Distress Ink. The paper which I love is Give Thanks by Imaginisce. Wow this card is so gorgeous!!! I LOVE your coloring! That fox is so cute! Great autumn scene! TFS! Beautiful scenery! Excellent pattern choices too! Love it! This card is so beautiful. I love your coloring on the sky and cute little fox, and the papers you chose are just perfect! Thanks so much for sharing. What an adorable little card and scene you've created here! LOVE the cutie scene you created!!!! love the papers you chose you really did an outstanding creative job!! . YOU ROCK!! What a cute little fox, love the coloring. And the fall scene is adorbs! It is my favorite time of year too. Love this scene you created. Love your card. Fall cards are simply the best!! Love your use of the trees with the little fox. How adorable! Love this set, the fox is too cute!! TFS Brigit! Your "scene" is too precious! Don't you just love that all Emma's dies and stamps go together? Cute, cute card! Love how you incorporated the tree dies. I absolutely love the beautiful scene. The critter is just way too cute. What a CUTE card! 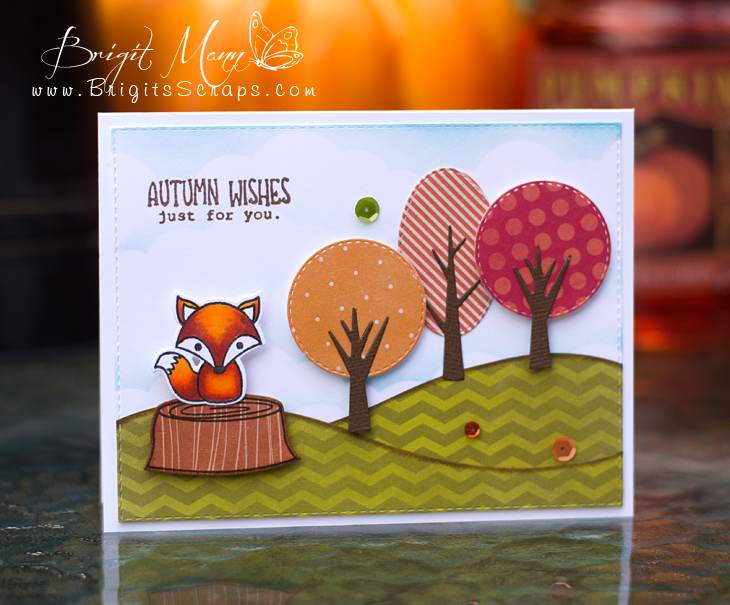 The scene is adorable and love the fall papers and adorable little foxy! To cute for words! That fox is adorable love all the colors. This set is adorable as is your sweet card! I like the trees and edge die...beautiful scene! Your card is adorable. I love that fox, he's just the cutest. what a really cute set of tags!! Everything about this card is so adorable... I just love the trees! Great inspiration and I'm looking forward to the release! Adorable card! Love the colors you used:) Thanks for the inspiration! So cute Brigit! Perfect idea to match the little fella with the trees! Cute! What a great scene card! I love your colouring on the fox and the sky. Also love the pattern choices. Everything comes together beautifully. Such a cute card! This new set and the set for the trees that you used work so very wonderfully together. Love this new set and the cute critters that are in it. What an amazing little scene you've created! And such a cute critter! Can't wait for these all to go on sale! Absolutely wonderful card. Great Job. Love the way you did the trees. What an adorable fox. Thanks for sharing your sweet card. This is so adorable. I am in such love with this set. Your scene is just wonderful. Beautiful card! Love the colors you chose and all the little details. I also adore the sentiment. Too much fun! Absolutely Adorable!! I cannot say enough great things about this card you created! Love the colors~ Love the hills you created ~ Love the trees!! Love it all!! I just saw this one of the Facebook groups and I had to pop over and see more. It's gorgeous! I love the little fox and those trees are perfect. Oh my word Brigit!! EEK this is AMAZING!! LOVE the way you colored the fox and oh my the whole scene is FABULOUS!!! Yay, Fall! I love the trees! This is such a sweet card.